Lace up leather boots make a great fashion statement. These knee-high boots were not made originally as a fashion element; however, they are now fast taking over in a variety of fashion trends. Lace up leather boots can make anyone’s wardrobe stunning. However you should know how to choose them for yourself to get the most flattering appreciation. Take a look at a range of exclusive lace up leather boots from Gypsy-Dharma and you will fall for them. Here is a little information about these essential components of a trendy gal’s wardrobe which will make you love them even more. 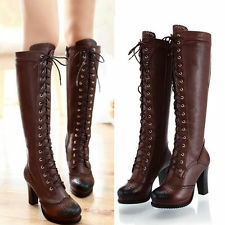 Lace-up boots are a type of knee-high boots which are in turn boots that are knee high or reach right under the knee. While knee-high boots are characteristically tight around the calf and ankle, lace-up boots can be kept tight or loose according to the liking of the wearer. Thus they are just great for fitting for one’s individual comfort level. Various styles of lace-up boots are available like military and gothic looking. You can also get lace up ankle boots. 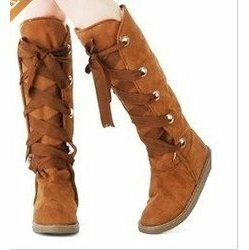 Size of calves is an important thing to consider while buying lace-up boots, whether you want them form fitting or you have thin or muscular calves. To choose a lace up boot that fits around your leg is important. Lace up boots have a great ability to benefit a woman’s silhouette. By far, you can remember following things while picking a perfect pair for yourself. If you have thick calves, choose a sleek style and dark color to make them look thinner. If you have thin calves, choose slouchy styles and prints to make them look bulk. You should play around different styles as the heel and toe are more linked with what your silhouette looks like than the real height of the boots. If you want to make your legs look longer, pointed black stiletto boots would do the job. Many gals love ankle lace up boots, because they look fabulous with shorts and short skirts. Flat lace up boots also look great with pants. You will see that they just go well with any type of pants. Even tight narrow jeans look great when paired with lace up ankle boots. And long skirt is also a great outfit to wear along with ankle boots. Like many other boots, lace up boots were once manufactured as a protective accessory; however, fashion industry has brought trendy styles and looks together in them. Now they come in various types, styles and colors, and you can wear them in various ways. Knowing which outfit to combine with lace up boots and how to wear them to show class is necessary while choosing a pair for you. In any case, your wardrobe should have lace up boots to wear with many of your outfits and that will make it really complete.